How can you impart effective training on using software applications? What does it take to enable your people master a computer application? You can go in for simulations of the software. Software training managers often look for a perfect screen recording, the feasibility to create a simulated environment, and expect to check learners’ understanding in a test environment. To your pleasant surprise, Articulate Storyline has all these features in-built, to develop effective software/ERP end-user training. You can easily create e-training modules with interactive simulations on software applications, using Articulate Storyline. Before we look at how Storyline facilitates this, let’s understand what a simulation is. A simulation is the replication of a real environment. It helps learners learn and practice complex and dangerous tasks in risk-free conditions. Let’s now see how Articulate Storyline helps create top-notch simulations. 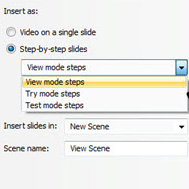 You can record your software simulation as a single video and insert it in one Storyline slide. The video needs to include the recorded screens, mouse clicks, and audio narration (if you want to explain verbally). You can use the video to demonstrate the process of working with the software. Your employees can watch these videos to get a better understanding of how the software works. You can develop an interactive simulation using the option Insert as ‘Step-by-step slides’ in Articulate Storyline. This option will divide the entire recording into various slides, containing hotspots and captions with instructions. Learners can view the logical order of mouse clicks and dialog boxes which specify how to complete a task, and then, try the procedure and practice it a number of times to gain mastery. You can develop interactive simulations in three modes. Watch/View mode: Users or employees can view the working of the software. Try mode: Employees or users can work on the process with step-by-step visual hints on the screen and Help options. Do/Test mode: Here, you can check the user’s knowledge. Employees need to complete the given task in the simulated environment, without any assistance or hints. In Articulate Storyline, you can first record the whole simulation, and then, publish it as a single video or step-by-step slides. So, you can use a single screen recording in multiple ways. Changing background images and unexpected actions are strenuous tasks after recording. You can do such edits easily and quickly using the ‘action fine-tuning’ option in Articulate Storyline. You can get the timing right while editing, using the ‘action editor’ feature. This helps you fine-tune the frames. Thus, we see that Articulate Storyline is ideal for developing simulation-based e-training modules on software applications. Hope you will make the best use of Articulate Storyline to develop your software training.